Heat oil in a Pressure pan, add mustard seed, cumin seed,ginger, garlic, g.chilles, onion & saute few mins. Add chopped fenugreek leves, turmeric & dhal. Add water & cook upto 2 to 3 whistle until its done. Check the seasoning & serve hot with roti or Plain rice. this is my favorite. looks yum! healthy and yummy dhal... super po. The colour of the dal looks very nice.I cook with only toor dal but u add 2 more dals now i too will try this.thanks for posting. Healthy and yummy one. Perfect with hot rice with little ghee. 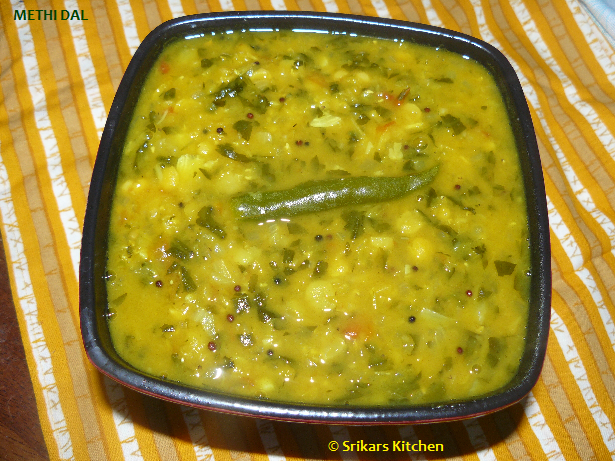 Realy comforting dal dish, looks yummy. Healthy and delicious dal! looks yum..
Yummy dal...I add a tomato to it sri..Goes great with rice and a gallop of ghee..
My hubby fav. healthy and nutrious. I try to make this atleast a week. Healthy n yummy greens.Goes well with rice and rotis! Nice pics! Lovley dhall, i used to make with palak or ordinary greens, looks inviting. This is our favourite dhal. I also do with spinach..Yumm and delicious. Wow, delicious,healthy my favourite too. We love it, though I make it only with toor dal..Got to try the moong n chana dal in too.. I love Dal methi! It looks very delicious!